Crete villas with pool, self-catering accommodation, cottages, holiday lets and luxury rental villa holidays in Crete, the largest Greek island. The Rethymnon and Chania regions of northwestern Crete are characterised by a lush landscape which is complimented by dramatic countryside which includes the dramatic Samaria gorge. 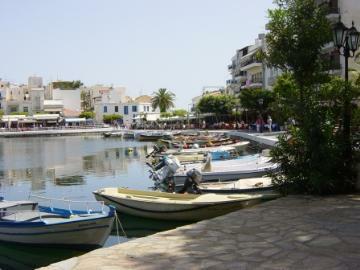 The previous administrative centre Chania has perhaps the most attractive harbour on the island. 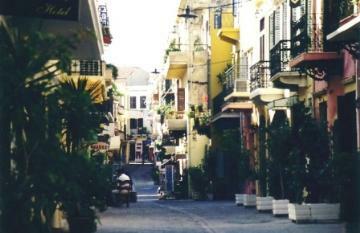 Heraklion, the capital is a central hub, to the east is Agios Nikolaos and the museum island of Spinalonga. The south is relatively remote and quite hot. We have 36 villas in Crete. 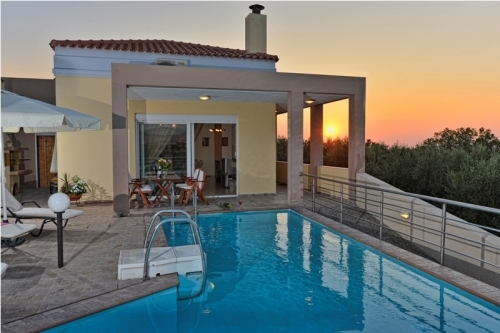 Clients staying in villas near Chania tend to use it as a base for visiting the western region of the island. Chania is one of the islands four provincial capitals and is amongst the most attractive, with beautiful historic old areas set against a backdrop of azure blue seas and dramatic mountains. There are two International airports on the island of Crete, Heraklion and Chania. There are direct international flights into both airports. Ryanair recently added flights to Chania from Manchester. The main capital of Heraklion (Irakleio) lies on the north coast and just to the west of the town is the island's main airport Heraklion (HER). If you don’t want to drive too far from the airport this is a good area to choose. Chania hosts the island's second international airport, Chania airport (CHQ) although the area is still easily accessible from Heraklion airport (HER) 142km (around 2 hours and 27 minutes drive). The climate in Crete is perfect for holidays from Easter to October. Temperatures rise high in school holiday period of July and August though the sea breeze helps. To the west of Chania, there are numerous sandy beaches over a stretch of 21 kilometres, with the beach at Agioi Apostoloi being one of the quietest. Rethymno is the smallest of the three major historical towns of Crete and we have a number of excellent villas in this area. It is situated equidistant from Heraklion and Chania between which there are regular buses. This picturesque town boasts numerous old houses and buildings dating from the Venetian and Turk occupations. Once the Greco-Roman town of Rithymna this site was also frequently occupied by the Minoans. During the 16th century Venetian occupation, the town prospered and many elegant buildings were erected including the impressive Fortetsa which acted as a defence from marauding pirates. In Rethymno, the charming harbour front is flanked with outdoor cafes and a restored 13th-century lighthouse stands on its breakwater. Looming above the inner harbour is the fortetsa designed by Pallavicini for defence against the likes of Barbarossa who sacked the town in 1538. Within the mainly intact ramparts lie a mosque, church and governors’ house and during the summer open-air concerts are hosted here. As well as the beautiful sandy beach located in front of the town Rethymnon boasts the longest sandy beach on the island (12 kilometres in length) on its west side. The Samaria Gorge national park is, without a doubt, the most spectacular landscape on the island. There is a wonderful walk covering 18 kilometres along a well-marked path accessed from Xyloskalo via a tortuous zigzag pathway which descends an impressive 1,000 metres in the first 2 kilometres. You will pass the village of Samaria, abandoned in the 60’s and arrive eventually at the seaside village of Agia Roumeli where you will find welcoming tavernas. In all the walk takes five to seven hours and there are useful water fountains along the route. Look out for Kri-kri a protected species of the wild goat which is rarely seen outside the gorge itself. Mount Idi is the highest mountain on the island, at 2,456 metres it dominates the Psiloretis range. It is renowned in Greek legend. The main archaeological site is the Minoan palace of Knossos.